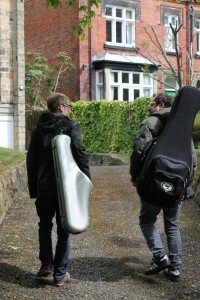 Saxophonist Matt Anderson and guitarist Jiannis Pavlidis have spent a great deal of time playing together over the past five years in a variety of different contexts, however they are at their least constrained and most spontaneous when working in the format of their latest album, where they are heard simply as a duo. On ‘Alone Together’ they build on a shared passion for the music of the Great American Songbook, performing classic songs and jazz standards in an open and sometimes abstract manner which can only be achieved by two musicians with an intuitive feel for each others’ next move. ‘Alone Together’ is a record in the purest sense of the word. A document of what happened over the course of a day in the studio. Recorded at ‘The Crypt’, Liversedge, West Yorkshire. Saxophonist, composer and band-leader Matt Anderson graduated from Leeds College of Music in 2010 with First Class Honours, also receiving the Sam Hood Rosebowl for Outstanding Performance. He has gone on to work with many of his former tutors, appearing in bands led by Jamil Sheriff, Mark Donlon and Jamie Taylor, and he released his debut album with his band Wild Flower Sextet in 2015 alongside a national tour, with Selwyn Harris of Jazzwise describing it as, “their own unique stamp on Shorter’s very personal repertoire… of a quality that resonates with its inspirational source… Enjoyably un-pretentious.” This year, he re-located from Leeds to London to study for a Masters at the Royal Academy of Music. Born in Greece and now based in Leeds, guitarist Jiannis Pavlidis attended Berklee College of Music in Boston, USA, studying with Jon Damian (tutor for Bill Frisell, Wayne Krantz and Kurt Rosenwinkel) as well as having external private lessons with Jerry Bergonzi. He started working professionally in 1983 and since then has performed in Sweden, America, Serbia, Greece, Cyprus and England. He is a principal lecturer at Leeds College of Music and has frequently performed all over England and Greece over the past eight years, participating in tours and recordings as a leader and with world renowned jazz artists such as David Liebman and Adam Nussbaum.